As we inched closer to having a full staff (getting one teacher) we suffered the loss of three members. First our headmistress became sick with malaria and missed most of the week and then our two volunteers Katie and Joost were forced to leave our school temporarily for VISA reasons. I will not get into the politics, validity, or reasons for immigration’s concern with our volunteers or their money, but we seriously missed them in the classroom with our depleted staff. This in turn forced me out of the classroom a bit so that I could help deal with their situation. So here we are, almost a month into school and we are struggling to keep our people in the classroom. It is these challenges that allow us to learn and better prepare ourselves for the future of our project and the role volunteers will play. It is an unfortunate reality that this country has not figured out how to properly welcome or keep volunteers without forcing them to pay large sums of money and jump through hoops. For instance my passport size photos went from a required 6 with a blue background to 8 with a white background (pushed back my VISA 3 months) only to find out a month later that my white background wasn’t white enough… it never ends. We are hoping and praying for a speedy resolution to this situation as well as clearly defined roles for our volunteers and visitors we hope to welcome to our school. We are definitely learning on the fly with this one! On a far more positive note we welcomed Chris, Mary and Cassandra Causey back to Mailisita for the first time in 5 years. They were a part of the first group that ever visited Mailisita and some of the founding members of the Mailisita Foundation. I first traveled over here with their son Alex in 2010 and it was an incredible experience to share in their visit as the re-familiarized themselves with Tanzania. It was also especially unique to hear about how much the project has changed in five years. Their passion and commitment continue to drive the project forward and keep focus on the project at home and in the St. Joseph community. They were so impressed with the work that has been done and were a big help this week guiding us through the growing pains of immigration and other government issues. It was so great to share so many days with them. They even worked at night (to avoid immigration problems) to paint a beautiful mural with the help of Katie and Joost. This also lead to many excursions together including a first for all of us, a day hike up Kilimanjaro. I have lived here for a year and a half at the foothills of Mt. Kilimanjaro, yet I have never been up. It was a beautiful hike that was also physically tiring, trekking 18km up to nearly 3,000 Meters above sea level. We saw waterfalls, monkeys, and when we reached Maundi Crater we could even see all the way into Kenya! We could see all the small villages and towns spotted throughout the green plains in the Kilimanjaro region of Kenya and Tanzania. What was undoubtedly the highlight of the trip happened during the last thirty minutes of the hike when we were observing the monkeys in the trees. I was hiking ahead with Adam and Joost when we heard “oh look monkeys!” The Causeys had stopped to look at the family of monkeys together and take a few pictures. We of course took a few steps back and watched them as a family of monkeys scurried above them in the trees. We then heard a loud ‘thud’! We looked over and saw a busted avocado. Then another ‘thud’ and another ‘thud’! The monkeys had started to throw rotten avocados at us and narrowly missed each time. Apparently they did not like us disturbing their meal time or they were offended by us taking the pictures, either way they were not happy. Naturally their response was to grab the nearest thing (a fruit) and just throw it at us. Now there was some debate as to whether the monkeys were “throwing the avocados at us” or discarding them, but truthfully I have no doubt. There was a whole lot of land all around us, but the avocados were striking the walking path we were on which was not more than 3 feet wide. The monkeys were definitely marking their territory and did not like us being there. I will write again soon. We have been incredibly busy at the school and hotel being short staffed and also with the Causey family visiting. I have been feeling very tired for a few weeks, which I thought was a result of the work, but in fact was malaria. I found out on my birthday (Friday) that I was suffering from another bout with malaria when I woke up feeling very, very old and sore. I could hardly prop myself up to get out of bed and finally I decided to go to the doctor. Sure enough, I have malaria again. I will write all about it and my birthday weekend sometime this week in between sleeping, teaching and more sleeping. I will fill all of you in on the details of malaria as well as my birthday weekend in Tanzania that has of course put my third bout with malaria into perspective. Our new year has started here at the school and we are so happy to see many positive changes. We are establishing new guidelines for acceptance to our school and reducing our class size slightly from 44 to just under 40. We are making sure that the needy children come first and doing our best to know what we can before they enter our school. It was a slow process and it did meet with some dissent, but sometimes change is hard. We have tried to eliminate any sort of favoritism or nepotism that is bound to happen without strict requirements for our school. I of course was asked to explain all of this to the parents, because someone had to do it. It’s a hard spot to explain why one child may be eligible for our school while his neighbor is not, but it is the only way we can truly meet the goal of our foundation of educating the poor and orphaned children first. Sometimes that means we have to take one child instead of another, but unfortunately we don’t have two classrooms for each grade or enough teachers to handle such a situation. In fact, we don’t really have enough teachers at all right now! Unfortunately it was not all rainbows and sunshine in our first couple weeks. We arrived at school with 4 teachers which would be standard in America, but here it is not. We were without 2 teachers who would teach our social sciences and vocational skills classes. We had made hires without following very strict guidelines or interviewing and as a result they were hired without knowing when they could start. One will show up in mid-February and another teacher never showed up at all. This means that our teachers would be teaching every period and switching between classes all day long. Because one of our teachers only speaks Kiswahili and another is our headmistress it is not uncommon to be walking by a class and see children teaching themselves or our matron. It is a growing pain for sure and a learning process for all of us. We (the foundation) are a bit limited in our influence when it comes to these sorts of situations. We cannot force the hand of anyone, only advise them no matter what the situation or if we know they made a mistake. This has been difficult as we see instructional time go wasted, and I see the teachers tire quickly because they are not used to teaching all day. Quick note here, our primary and secondary teachers do this every day all year long, so next time you see a teacher in the states remind them that they are the best and give them a hug! Adam and I have found ourselves at times energized and at times exhausted by the chaos. It is certainly a new situation for the both of us who have grown up in and worked in the school system. Of course, you know me, we have found two huge bright spots in this mess! Our long term volunteers Katie and Joost have arrived and have really stepped up! They are going to be able to help during class periods of instructional time at Stella Maris, and they have filled in very well! Because we welcome so many visitors from our hotel we have to be strict in preserving the learning time of pupils. We will already be making up for this first month already so we will typically have visitors (less than one full school term of 3 months) help with tutoring and our kindergarten (great opportunities in themselves), unless they are a certified teacher. It takes routines to help children learn and we are already asking so much of our children! With Katie and Joost observing and learning this week, they have already been jumping in and helping out with Adam and I whenever and wherever they can. They have also enjoyed playing together at recess which is always a favorite of all our guests. Also they are really stretching their English development in talking about how tall Joost is comparing him to all sorts of animals. Another bright spot is the leadership that we have seen in some of our children. They have taken over their own classes whenever a teacher is out of the room. They are playing math flash card games, reading story books and often running a very tight ship. When you look at our classrooms from the outside you will often see two or three children outside from misbehaving while our “student leaders” are trying to run a structured learning game! It is definitely encouraging for all of us. We can be confident that there are plenty of good leaders that are growing because of our school. There is a lot to be happy about and a lot to be fixed. Then again if everything was perfect then I would be pretty useless here and they wouldn’t need our help! I will be sure to update all of you about our progress at the school, and hopefully by the next post we will at least have one more teacher! These past few weeks have been extremely busy! We are finally seeing our hotel humming along with more than 30 guests last night and tomorrow, and from all over the world. 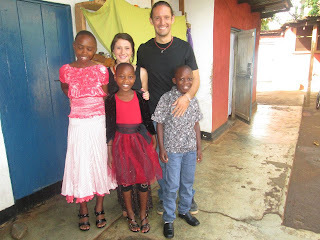 Aside from the hotel keeping me busy, a very good friend of mine, Amanda made her first visit to Tanzania. This gave me the “excuse” to do some of the sightseeing that I don’t normally get to do and hadn’t done since my first time to Tanzania. Together we went on a two day safari that turned into a three day safari (one of our tour operators Paul Shayo gave us a safari day for free), saw all parts of Moshi, stayed in all sorts of budget hotels (full of bats and a couple without air conditioning in the middle of an African summer), spent time with my family here and even found time to travel to the coast to swim in the ocean. 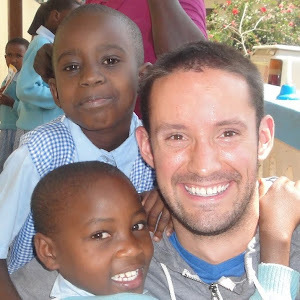 What I found most enjoyable about all of these experiences was not only sharing Tanzania, the children, the people and the culture, but also seeing someone experience everything here for her first time. It reminded me how taken we all are by the beauty of this country, and most of all the people. I was reminded of all the small things that I take for granted that are so different and also so beautiful. We loved watching lions hunt in the Ngorongoro Crater and swimming in the Indian Ocean, but the greatest moments were shared with the children and families here. After everything was over Amanda said the greatest part was being together with my girl Catherine’s new family. To be a part of another family, to be welcomed and to share Christmas together with them, so that is what I am going to write about. Amanda watching her first goat "preparation"
Christmas in Tanzania was quite a bit different than my previous Christmas in America. We woke up in the morning and then set out with a few Stella Maris staff members to buy a goat. For Chaga tribe members, it is common to celebrate big occasions such as holidays, weddings or send offs with “mbuzi choma”. Mbuzi choma is a goat roast, so just picture a pig roast with a goat in place of the pig. We spent all morning walking through small Kibosho villages from hut to hut looking for the perfect goat. This was quite a process because we needed to find one big enough to feed at least 30 people. After finding the perfect goat, we argued, negotiated the price and then tied it up. We then put him in the back of our car and drove it home. I will spare everyone the details and pictures of what happened next, but Amanda and I bonded with Masai, Jordan and Innocent (three of our male employees at Stella) as we prepared and slaughtered the goat. Amanda and I kind of just stood off to the side and watched, horrified, as the boys prepared the goat. I have taken part in this process multiple times and even drank the blood (a masai tradition) but truthfully I am glad I didn’t grow up on a farm. This of course reminded us both of where meat actually comes from and left us a bit queasy. For lunch we joined Catherine’s new family as well as about 10 children and parents from 5 families for a big meal that we organized and shopped for (4 families are other Stella Maris School families). What is so special about celebrations here is that they are never exclusive or in any way limited to one family. Neighbors dropped in, shared food and drinks and just laughed together. Amanda and I spent our time with the children mostly but also enjoyed seeing the parents and grandparents of other families. Of course they do not have any grand dining tables or dining rooms, so we enjoyed our meal on the lawn and front porch of their home. We sat in plastic furniture and ate off of plastic tables, it was so simple but so unique. Neighbors would walk by, see us all together, greet us and then wander in to join us. 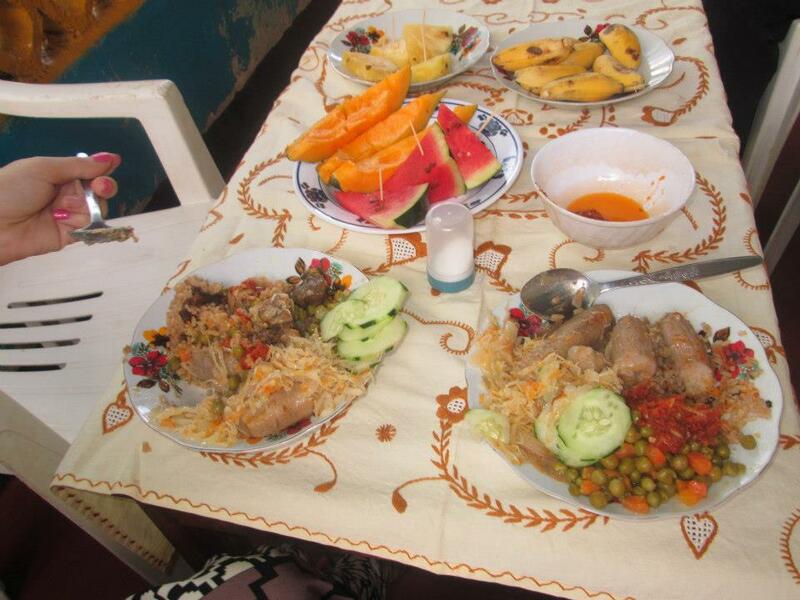 We enjoyed banana stew, rice, cabbage and other Tanzanian foods. It was not exactly a typical Christmas meal of my childhood, but the food was delicious. Most importantly, we had families together. Families enjoying each other’s company and spending the day together. Later on the evening was time for the Stella Maris Family feast. For the first time, we all sat together for food, the receptionists, security guards, cleaning staff, waitresses and chefs. With our goat roasted, French fries, fried bananas and vegetables we had more than enough food, which was good because our meal was more than the Stella Maris Family. We sat together with the staff of the hotel, Catherine and her family, Amanda, Adam and 10 Romanian guests to share in our Christmas meal. Though our Christmas was different and not spent with our families from home, it was definitely filled with love and happiness. Everyone enjoyed the food, but also the uniqueness of the experience. Repeatedly throughout the day we were thanked for organizing and providing the food and for sharing the holiday together. It repeatedly caught me off guard, because I truthfully I couldn’t imagine any other way of spending the holiday. We were so grateful to be able to be with family. That evening we gave the children some presents that my family, the Schiffs (Amanda’s family) and my friends back home had sent. They sent Barbies, new clothes, toy cars and a few other presents. The presents were simple and understated by many standards. There were no video games or other fancy/expensive toys. But I had been holding on to Catherine’s Christmas list in my head for 3 months. It was simple, she said that for Christmas she wanted a red dress. That was it. One red dress. I remember my lists when I was younger and I am certain I never had a list that was less than 10 things. Stivin said he wanted cars and Lilian and Irene said they would like new clothes for church. Through the generosity of our families and all of my friends back home the children all received all those gifts for Christmas which happened to be their only Christmas gifts. The one strongest memory I will take from this holiday time is how humbled I felt. Seeing the children so happy and seeing how big Catherine smiled with her new red dress. How much I have always taken for granted, assumed about the holidays and although I always said “I know I am lucky”, I truly never understood how lucky I was. Not only lucky in the sense we have so much, so much of everything food, our home and just stuff but also because of family. I saw a girl’s first Christmas that was filled with family and love. She had loving grandparents, sisters, a brother, a guy trying to be a dad and her first Christmas presents to make her feel like the luckiest girl. How despite its simplicity, her Christmas taught me so much. And this morning when I saw her she showed me where she put all of her new clothes and toys, gave me a big hug and said “thank you”. So I want to pass that thank you along to all of you that helped me make her Christmas special and those of you that supported me to be here to share in a very special Christmas. Merry Christmas, Happy New Year, Thank You and God Bless.